It was the ancient belief that certain individuals had the ability to contact divine forces and receive information by interpreting signs and symbols displayed by these forces. There were very many methods of divining in the ancient world, as many as the imagination could perceive. The people knew on some level that "signs" are all around us, and that occurances in the natural world are reflections of our own energetic influences upon it. Far from superstition, the methods of divination were born from this simple understanding of our reality. Energy precedes form. Everything comes into being on the energetic level before it becomes a concept, form, circumstance or action. Form is the shape that concentrated patterns of energy takes. 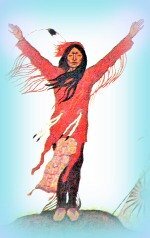 Feeling or sensing this preformed energy is the means of intuition, clairvoyance and divination. When the energy pattern meets the medium (human or divining agent), a synchronicity occurs that seems magical. 'Coincidences' occur, 'signs' become obvious, hidden thoughts or feelings are exemplified, etc. The preformed or existing energetic patterns can be seen as images, or be revealed through a divinatory tool or technique. The inner self is aware of preformed energy before it has manifested in the material or experiential plane, therefore, these "probabilities" can be perceived and discerned through various methods. In our modern world, we refer to divinatory processes as readings. We can get read, have readings or read ourselves. 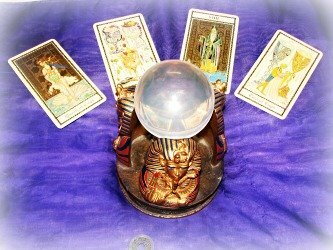 We get psychic readings, tarot readings, have our palms read, have our handwriting analyzed, and get astrological forecasts. Some other popular methods of divination are, reading tea leaves or coffee grounds, Rune stones, I Ching, crystal balls, dice, and even regular playing cards. In Spiritualism, 'billets' are used. These are small pieces of paper that a recipient writes their name on and/or holds to "infuse with their vibrations" before giving it to the reader. This is a form of psychometry - the reading of vibrations from an object. And my personal favorite, flame messages. In this technique, billets are passed over a candle flame just touching it and moving quickly to get a smoke imprint without catching it on fire. The patterns of the soot reveals images that can then be read. When I first experimented with this technique, I was amazed at the results. My brother and his new girlfriend at the time, wanted me to read for them. When I looked at her paper, we were all stunned to see the name of her ex-husband spelled out in smoke!! It was hard to believe BUT it happened! Several years later, after I was ordained and began working church services, the message service quickly became my favorite task. I used the billets for flame messages most often. Since I had some family members in the congregation, I was able to confirm for myself the accuracy of this method over time. We know that the present creates the future, but we may want to check the energies that are influencing our lives at certain times. This is where self-divination is a great tool. Keep in mind that the information you receive from readings comes from the energetic patterns and thoughtforms that you have created through your day-to-day activities and emanations. It shows the energies that have been set in motion, but they ARE NOT set in stone. If you don't like what you are seeing, take steps to change your course. Remind yourself that we create and recreate our lives daily. The reading indicates to you what is likely to manifest for you if things continue on in the same manner as they have. 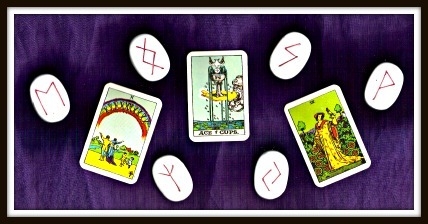 If you are new to divinatory practices, I would recommend an established system such as the Tarot, I Ching, or Runes. Be sure to get a 'self contained' set that comes complete with instructions for the layout, symbolic meanings and interpretations. Most cards come with basic instructions but are even better if they are accompanied by a book. Prepare yourself before starting your session. This is advised for best results. 1) Do a cleansing ritual to eliminate any negative influences hanging around. For suggestions here are some protection techniques . 2) Get into a receptive mindset. This simply means to relax and calm your mind. Deep, controlled breathing will help. Try to clear your mind of distractions. The more clear-minded and focused you are, the better. For help, see these mind-clearing exercises. 3) Concentrate on your question or the situation you want to know about while you are holding your divination tools. Try not to think about what you want the results to be, remain neutral so your thoughts won't influence the outcome. We present things to ourselves as we seek them or need them, seemingly 'out of thin air'. This is because our subconscious is always on the job, manifesting for us. We can find answers and clues to our questions, goals and desires because we energetically draw out the things we seek, be it knowledge, relationships, objects or situations. We can do this because we are part of the Whole, always immersed within the substance of all of existence. Called serendipity, synchronicity, or simply coincidence, it can be induced intentionally. When you purposefully 'call out', or make your request 'to the universe', this is called "drawing down" (as in, 'from the heavens'). More precisely, it could be called "drawing out". You literally are summoning what you need from the vast substance of the universe. A simple drawing out method of divination that I like to use for inspiration or guidance, is to let myself be drawn to a book and open it at random, letting my finger rest also on a random spot. Sometimes I have a goal and other times I'm just looking for inspiration. Though not the 'official' terminology, I call this - book scrying. If you do this, have an intent or request beforehand for best results. When I was younger, I used to think how great it would be to know what the future held. I couldn't afford readings, so I tried to read for myself. I started with the Tarot and branched out into other kinds of divinatory tools. It was fun and informative and I gleaned a lot of wisdom from the many methods. Reading for yourself can be difficult since you don't know if you are seeing what you want to see by projecting your own desires onto the medium. I began to wonder how much my own thoughts and expectations influenced the outcomes or if I was interpreting the reading with bias. It's hard not to. For me, the process became more of a self-awareness exercise. Then there's the neggies. If you get a negative response or a scary looking card, fear sets in. It can cause worry and unhealthy expectations. I began to think that I'd rather NOT know, then I wouldn't focus on the worst possible outcome. Whether you give yourself a reading or get one from someone else, be aware of the fact that a negative forecast can become a self-fulfilling prophecy. The tendency is to hold onto it and give it energy by believing in it, fearing it or expecting it to occur, in which case you may help to manifest it. If you get a warning during a reading, take it as a caution, not a fact. Don't let it become a fixture in your mind and plague you by replaying it over and over. Remember that readings are based on nonphysical energy. Forecasts are not definite. WE create our destinies. We can use divination to gain insight into ourselves and to what is occurring around us, but we ARE the masters of our domain. We can transmute and transform the energy forms affecting us, and we can make changes in our own lives. If you decide to look for a "reader", it's best to go with a recommendation from someone you trust or through a source you trust. Psychic Fairs and Expos will have several readers available who give mini-readings for nominal fees. You may find someone you'd like to book an in-depth reading with after such an initial meeting. Use your intuition and common sense when sitting with a reader. Never pay more than the initial agreed upon amount for the reading. Don't fall prey to unscrupulous cons that want to charge you to remove a curse or perform a spell or give you a tip, etc. You may want to purchase their wares that they sell, i.e. books, gemstones, sage, etc., that's fine as long as they go for a reasonable rate. Always use discernment because sadly, there are predators out there looking to take advantage of the unaware.